Prime Minister Sheikh Hasina on Thursday said some misguided people are tarnishing the image of Islam through misleading interpretations of the religion. “The image of Islam is being harmed through misleading interpretations. But we want people to acquire correct knowledge about Islam and practise its rituals,” she said. The premier was addressing the inauguration of the construction work of nine model mosques and Islamic cultural centres through videoconferencing from her official residence Ganabhaban. 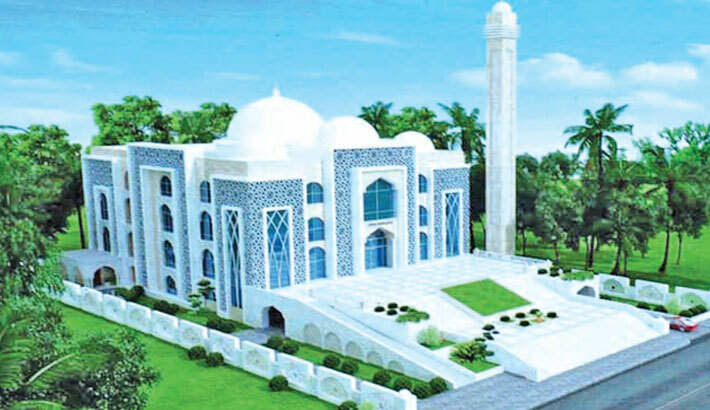 The government has undertaken the project to build a mosque and a cultural centre in each district and upazila across the country. She said her government has been making constant efforts to establish the fact that Islam is a religion of peace and make people aware of its real teachings. “We want to uphold the dignity of Islam as a religion of peace and maintain peace in the society,” Hasina said, adding that it is the prime objective of the model mosque project. The premier called upon the people of all religions to freely perform their religious rites. “Bangladesh is an abode of the people of different religions. So, every person will freely practise rites of their religions. It was the dream of the Father of the Nation,” she said. Under the project, a total of 560 mosques will be constructed across the country. In the first phase, model mosques will be built at Tungipara, Chattogram, Mymensingh, Sylhet, Jhalokathi, Khulna, Bogura, Noakhali and Rangpur. Religious affairs minister Matiur Rahman, among others, spoke on the occasion. Leader of the Opposition Raushan Ershad spoke from Mymensingh while Bangladesh Imam Samity president Qazi Shaker Ahmed took part in the discussion from Chattogram. The premier said Bangabandhu Sheikh Hasina established Bangladesh Islamic Foundation with an aim to properly preach Islam and also took many other steps. After his killing, Bangladesh has gone backward in every arena of the country, she added. The premier said Bangabandhu advocated for secularism to ensure religious rights of every person. “Secularism doesn’t mean losing religious faith. Secularism means religious freedom and it is the main spirit of Islam,” she added. “We want to build a Bangladesh where secularism will prevail in the heart of people who will observe their religious rights in right way,” the premier said. Road transport and bridges minister Obaidul Quader, SDG affairs chief coordinator at Prime Minister’s Office Abul Kalam Azad, Awami League religious affairs secretary Sheikh Md Abdullah, Bangladesh Islamic Foundation director general Shameem Mohammad Afzal and noted Islamic scholar Farid Uddin Masud were also present. The premier also exchanged views with government officials, Imams and cross-section people of Mymensingh, Noakhali, Sylhet, Chattogram, Jhalkathi, Khulna and Bagura. Later, a munajat was offered, seeking successful implementation of the mosque project as well as peace and prosperity of the country and its people. Pesh Imam of Baitul Mokarram National Mosque Hafez Minazur Rahman conducted the munajat. The premier also opened the newly constructed Companyganj-Muradnagar-Homna Highway and Gouripur-Homna Bridge and two railway overpasses -–one at Shashangachha and another at Padua Bazar— in Comilla to traffic. While inaugurating the projects, she made a promise to develop the country into sonar Bangla as dreamt by Father of the Nation Bangabandhu Sheikh Mujibur Rahman. “We are a victorious nation. So, we will live with pride in global arena. We’ll implement the dreams of the Father of the Nation by building a developed, prosperous and sonar Bangladesh,” she said. The premier greeted the people of Comilla and thanked the road transport and bridge minister, Bangladesh Army and all others concerned for their efforts to implement the three projects. She also talked to local public representatives, including AKM Bahauddin Bahar MP in Comilla, through the videoconference. Bridges minister Obaidul Qader, engineer-in-chief of Bangladesh Army Major General Siddiqur Rahman Sarkar also spoke at the programme. Principal Secretary Nojibur Rahman conducted the launching ceremony while road transport and highway division secretary Nazrul Islam made a brief description about the projects through a power-point presentation.